Although it’s not certain that they are officially “Twilight” road signs, someone in the Portland area is using the lettering, imagery and coloring which resemble the saga’s design. 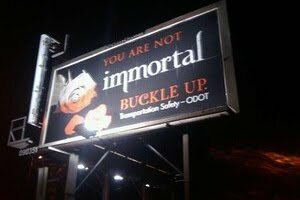 The photo of the sign was sent in to the Portland Mercury's Blogtown. People have gone crazy for “Twilight.” This week in Forks, Washington they are celebrating Stephenie Meyers Day, an entire day in honor of the author of the series. You can even buy “Twilight” postage stamps. New York Fashion Week designers were even influenced by the films.